VMware provides a platform for building an internal enterprise cloud environment with the vRealize Suite. 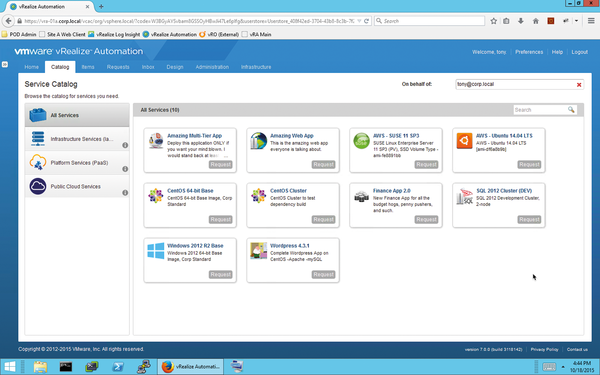 The heart of the suite is vRealize Automation, a cloud management platform, which has now reached version 7. It promises fast provisioning via the self-service catalog, automatic provisioning of complex services, and multi-vendor management of cloud resources (Table 1). Product Software for managing and provisioning cloud infrastructures. Price The advanced license of vRealize Automation for managing 25 VMs is available from around $6,245. The enterprise license starts at $7,745. System Requirements vRealize Automation has very exacting hardware requirements in part; the individual components are subject to various requirements, which can be found in the product data sheet . The main field of application for vRealize Automation is automated and standardized provisioning of infrastructure resources – from individual virtual machines (VMs) through complex environments for developers and users. In many companies, this is still a manual process where provisioning such resources can take several days or even weeks. In contrast to this, vRealize Automation users can order desired environments from a web-based self-service catalog and then sit back and wait for vRealize Automation to fully provision this using automation techniques. Such development environments are typically generated automatically for the customer within a few minutes. With this automation solution, VMware is focusing primarily on generating infrastructure components – that is, individual or whole clusters of VMs and associated networks and firewalls but also components such as virtualized load balancers and routers. Additionally, it is possible to publish virtually arbitrary services, such as resetting passwords or creating new users in Active Directory in the self-service catalog. This is achieved with the help of vRealize Orchestrator – an orchestration engine provided to vSphere customers free of charge by VMware. This engine plays an important role as the mediator for the vRealize products and now enjoys widespread support in the VMware community; many additional plugins are available for it. A further field of application for vRealize Automation is supporting complex DevOps environments. This no longer simply involves creating individual infrastructure components; instead, it is about deploying complete applications and managing them throughout their life cycles – from creating and updating an application until its final deletion. In addition to automating the process of creating resources, the focus in many enterprises is also on governance. The product lets you manage the entire life cycle of provided resources via policies and processes. Among other things, this includes multilevel approval processes or precise guidelines on the deployment duration for resources. Because of the complexity and the history of the product, the installation of vRealize Automation was always a challenging task in previous versions. For three years, VMware has gradually ported the original Windows-based product to Linux. Although deployment of the supplied Linux appliances is easy, much manual configuration work was required for the remaining Windows components in the previous version. VMware has addressed this point of criticism in the new version and provides a comprehensive web-based installation wizard (Figure 1) that can perform a distributed installation for various deployment scenarios (small, medium, or large environments). Figure 1: The new installation wizard handles much of the configuration work for the admin. For admins, this means that the install itself is dramatically simplified – on the whole, administrators only need to handle the preparatory work, such as deploying Microsoft SQL Server and the basic configuration of the Windows machines, which is a big relief compared to previous versions. Even larger environments can thus be set up within a short time. Individual vRealize components can be based both on Windows instances as well as on Linux appliances, due to the history of the product. In version 6, VMware started to gradually port features based on Windows in the previous version to Linux. A minimal deployment – but sufficient for a small lab or training environment – therefore requires at least one Linux appliance and one Windows node along with Microsoft SQL Server. In medium-sized and larger environments with high availability requirements, the number of nodes in the vRealize Automation environment increases significantly. 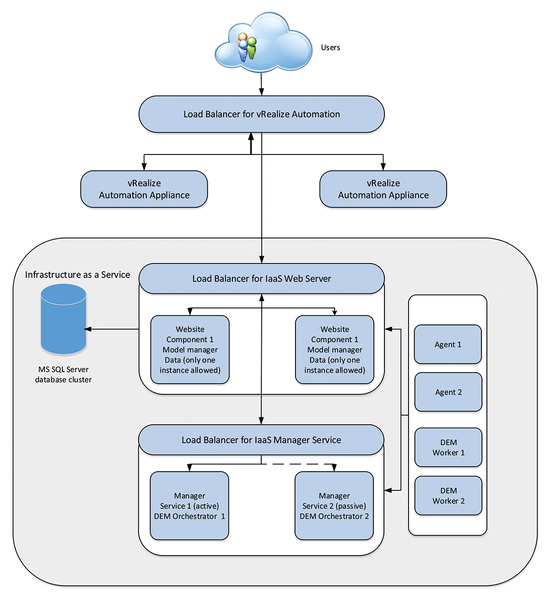 Figure 2 illustrates this logical design for an enterprise deployment: In addition to a cluster of Linux appliances including load balancers, two further Windows clusters need to be managed. First, there is the Model Manager Cluster, which is responsible for storing the Infrastructure as a Service (IaaS) data and deployment workflows. Second, the Manager Service handles communication with external systems, such as vSphere, Hyper-V, or even public cloud environments like AWS. Communication with the underlying hypervisor and cloud providers is handled by the "DEM worker" and agents. Figure 2: Logical design for enterprise deployment. Despite the complexity of the product, operation management in the vRealize Automation environment involves remarkably little effort – this works especially because VMware lets you manage and maintain the installation centrally. The most important building block of the vRealize Automation portal is the self-service catalog (Figure 3). This is the centralized interface between cloud consumers and service providers and can be most easily described as an online store for IT services. The requirements for a service catalog can be simply summarized: A catalog should be easy to use and provide a well-defined selection of ready-to-order services. On the other hand, the catalog location should capable of publishing ready-to-order services in a way that is as granular as possible. In the case of VMs, this means, for example, that consumers can make adjustments to the CPU, memory, and storage before ordering. Figure 3: Using the service catalog, resources can be requested by users in minutes. It is, of course, also beneficial for admins to have the ability to customize existing forms as well as create new ones. Because the catalog is used by different user groups, simple and centralized administration of user permissions is also essential. A customizable service catalog of this kind has always been vRealize Automation's strength. In conjunction with vRealize Orchestrator, the deployment options extend to arbitrary IT services, assuming they can be automated by Orchestrator – a major benefit compared to competitor's products. Another important feature – especially for large enterprises and cloud providers – is multitenant capability. It is important to provide each client with a dedicated organizational unit with its own directory service, permissions, and services, as well as isolated hardware resources for deploying VMs. vRealize Automation scores points here, too. One small drawback remains, however: vRealize Automation does not support client-specific data store libraries, for example, for storing ISO images.